I don't read many mysteries and thrillers which is mainly due to not having come across the right ones. 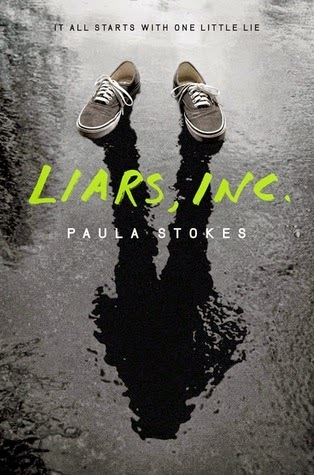 Thankfully, I've heard great things about Paula Stokes before so I decided to give Liars, Inc. a shot. I am so very glad I did. I really liked this one. Paula's writing style was engaging and I liked that this was from a male's POV. I liked Max's character a lot. He's not the popular kid at school, instead he's just kind of there with his star football playing best friend Preston, and his also popular girlfriend Parvati. Most kids don't pay much attention to him, but he's not this social outcast either. After Max takes the blame for a girl's ringing cell phone to land himself in detention so that he can spend a few hours with Parvati on Saturday, the girl pays him for her gratitude. Word gets around and soon Max, Preston, and Parvati find a lucrative business on their hands. Lying for their classmates as a means to make money. I thought this part of the storyline would be more of the focus of this story. Instead, the focus remains on Preston going missing after skipping out to meet up with a girl. Camping with Max is his cover story, so when Preston goes missing, Max is directly in the line of fire for questioning. Preston just isn't any old kid- he happens to be a Senator's son, so naturally the FBI ends up getting involved. It was really neat to see how Stokes broke up the story into 3 different parts. She starts with the present, which is full of action and intrigue, and then backtracks to how it all started and then catches up to the present. It felt like a tv show in that sense, where we see the bad stuff going down, and then it goes back in time so we can see how everything culminates to that point. I wasn't really crazy about him and Parvati because it didn't seem like they had that much of a connection together. There was one scene in particular where Parvati was talking about something related to the newspaper club and Max wasn't even remotely interested by it, instead wanting to move forward to the more physical nature of their relationship. I also felt unsure of Parvati and I didn't completely trust her not to hurt Max. There's not a whole lot more I can say without spoiling the plot, so I will just say that I really enjoyed this one. Even though I wasn't crazy about the romance, it wasn't enough to make me dislike the book by any means. While important, it didn't overshadow the main action and suspense that was occurring as Max tries to find out what happened to Preston and manage to clear his name at the same time. I definitely didn't see Stokes taking the direction she did, so that was awesome because I love being surprised by suspenseful plot twists. YES! I'm glad I wasn't the only one that didn't trust Parvati! I was so suspicious of her from the beginning and I just didn't trust her at all. I loved the plot twist in this one, and it definitely wasn't something that I ever would have guessed haha. Yes! It was the subtlest things about her! Like the way she'd shift her eyes and such! I was like, RED FLAG! Haha. Nope. I wouldn't have gotten this one either! I'm glad you liked this book, Jess! It got three stars from me - I didn't hate it, but I didn't love it. I especially didn't like Parvati - I liked her ish in the beginning of the book, but grew to hate her as the story went on. Unfortunately. We were very similar... up until a point. There were other things that really bothered me, but I liked the mystery story overall. That is a bummer Alyssa! She definitely wasn't a favorite, which stinks because I would have liked her had she not.. well you know. LOL. I'm glad you didn't dislike this one, and that you could still enjoy the mystery aspect of it! I'm glad you were surprised by the plot twists! I hate guessing everything out early on. I've been looking forward to this one!!! I've been super intrigued by this one since I heard about it and can't wait to read it! Me too! I didn't see that one coming either. So that's always cool. I hope you enjoy it if you read it. You know my hesitation with this one, so I am really glad to hear you ended up enjoying it! I definitely think I'll be making time for it now, especially since I don't read many thrillers so it will be nice to mix things up. Great review! I am uber nervous that you won't like it and you won't ever trust me again. HAHAH. I hope you don't hate it! I don't know if it's because I don't read thrillers and thats why I enjoyed this one? Never heard of this before, but I definitely want to hear more about it! It sounds really interesting and different, I love a good mystery. I hope you check it out Ailsa! It was a pretty cool read! I was given an ARC of this by my Secret Sister and I'm so excited to read it. I had planned to read and review by the publication date, but am probably going to start it today. Katie you'll have to tell me what you think of it! I hope you enjoy it like I did!